This book starts off with two stories, one in contemporaneous, set in 2007, and is told entirely through pictures. The other is set in the 1980s and is told through diary entries from Mary, one of the last orphans to live at Thornhill, before it is to be torn down to make way for a new development. 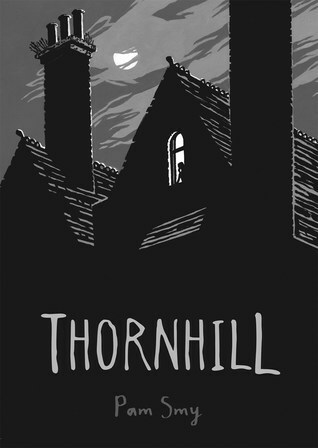 But we can see in 2007 that never happened, as Ella moves in behind Thornhill after her mother dies, and her bedroom looks into the abandoned, boarded-up old mansion. Ella sees a girl her age over there from time to time. And she starts to find these old dolls, which turn out to be marionettes, which she fixes up. We learn those were originally made by Mary, more than 30 years ago. The other girls go away, one by one, as they find other placements or even foster homes. Eventually Mary is left with the bully of Thornhill, who has been tormenting her for years. When it's just the two of them and almost no staff left, things go very south very quickly. And 30+ years later, Ella is drawn to the desolate and lonely girl she sees in that foreboding landscape. Has she found a new friend? This book is pretty dark. Not scary, but certainly not for the faint of heart or for younger kids at all. It's definitely for teens. The format is clever, the story is compelling, and I enjoyed it thoroughly. Sometimes it's fun to read a dark, creepy book with an ending that makes you go "Whoa!"